Creative Think: Recognize this Symbol? You've seen this symbol many times (especially on airplanes). Do you know what it means? One of my favorite ways to get into a creative frame of mind is to adopt what I call an "Ambiguous Attitude." That's when I'll look at something and imagine what else it could be or mean. This is a really fun exercise to do with signs that have pictographs on them (and no words). 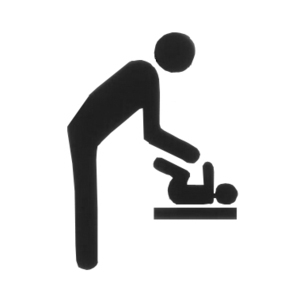 For example, for most people, the above sign means: "Here's a baby changing table." If you look carefully, you can see the bowler has taken the bowling ball out of the bag, and it's resting in the ball return area. And he's got his hand over the air blower to remove moisture so the ball doesn't slip out of his fingers. And you know he's ready to throw a strike. What does this symbol look like to you? Roger - great post! And I'm very excited to see you have a blog. I've been a fan of yours for about 12 years, and I even use your "Kick in the Seat of the Pants" book in the Creativity for Business MBA course I teach. I love this exercise! This reminds me of the Stick Figures in Peril Flickr group, where people upload photos of various warning signs and others comment with very funny alternative meanings to the symbols. You could get a lot of mileage out of that for this exercise! I think it's great to look at anything and see something else in it. This is why cloud watching is such a great creative exercise. So it's especially interesting to look at something that's meant to convey information clearly and see something else that was not intended. Love that game as well and actually do it all the time. Just like cloud watching as well (right David!). Looks like everybody got their imaginations going with this post. Thanks Timothy, David, Mindblob, and Nedra for your comments. I have to check out those stick figures in peril. Sounds like a lot of fun! Considering the season, I couldn't help but see someone carving a turkey, belly side up.